Unable to work as she fights cancer, Karla Vasquez wasn’t sure how she’d provide for her family this Christmas. But her hospice nurse and his colleagues stepped in to help. The mother of four thought she’d won her battle with breast cancer two years ago — but cancer wasn’t done with her. “In 2015, my cancer came back again, more aggressive,” she said. And it came back in more places, like her liver. 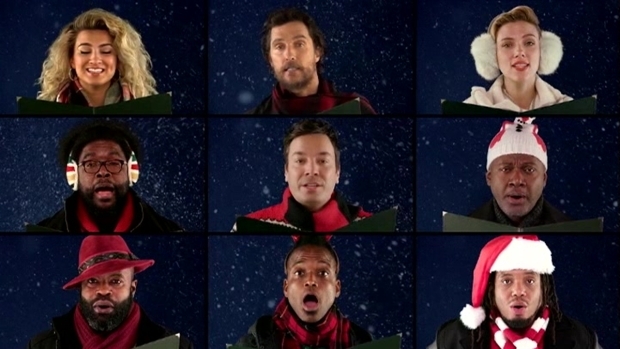 Host Jimmy Fallon and The Roots join Paul McCartney, Matthew McConaughey, Reese Witherspoon, Scarlett Johansson, Seth MacFarlane and Tori Kelly for an a cappella rendition of "Wonderful Christmastime." “I couldn’t walk, I couldn’t even take a shower, I couldn’t even dress myself,” she said. Several months of pills, radiation and chemotherapy seemed to help, until yet another diagnosis earlier this year. “I had seven tumors in my head,” Vasquez said. The cancer had spread to her brain. “I called all my kids, sat them down, and told them, and my daughter told me, ‘Mom, do it. I want you to live,’” Vasquez said. It’s a constant battle that’s taken a toll, and she hasn’t been able to return to work as a club concierge at the Tysons Ritz Carlton. Without her income, she and her husband didn’t have much money to spare for gifts. She wasn’t quite sure what would happen, but she gave what she had: her infectious, positive spirit. “When you give, you receive three times,” she said. He told his colleagues at Capital Caring about her. “Our volunteers and our staff just poured their hearts out and opened their wallets, went shopping, got gift cards, gave money, bought all sorts of gifts for the children, and made sure they had what they needed and enough to make a little bit of the rest of the year a little better, too,” said Rev. Carolyn Richard of Capital Caring.